Thank for these kind words ! My friend, I write in the main menu that I can not run dlc in the Russian version, although the description supports all languages. What do you advise? I'm sorry you encounter problems for installing this dlc. The DLC should work with all languages. I think maybe you have a problem with your binkw23.dll and binkw32.dll files when you launch your game. Have you downloaded and tried my DLL files (ME3Win32DLL) located in the download section of this topic? You should place these 2 files in the "...\Binaries\Win32" directory of your game. If that does not work with my files, try to install Mass Effect 3 mod manager to try another DLL files. I hope you will solve your problem soon. Ok thank for the screens. And If you remove the Tali Remastered DLC (DLC_CON_TaliMaster folder located in your DLC folder) does your game work normally ? or you encounter the same message when you launch your game ? Thanks for your reply, and sorry for the inconvenience. 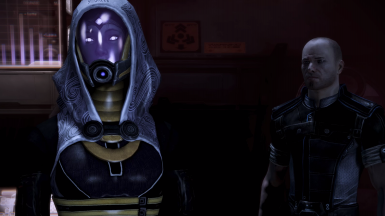 If you do not have the Citadel DLC, I'm pretty sure Tali Remastered will not work. 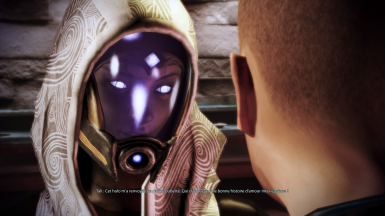 If you have all DLC, I do not understand why Tali Remastered does not work on your side.... it should be compatible with the Russian language. The TPF format is mainly used for textures operations, it seems to me that it is insufficient in my case, because my mod includes 3D models with animated face. 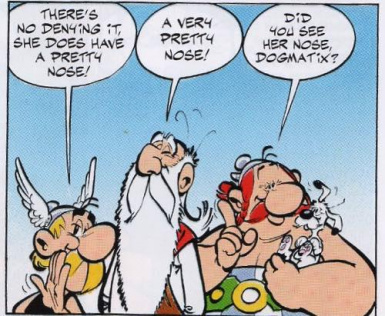 This explains why the mod has been fully mounted in DLC. Do you have a DLC called DLC_CON_END ? in your \BIOGame\DLC folder ? This file is a FREE DLC from bioware that comes with the Deluxe version of the game. Make a copy of your file and archive it with winrar. Upload the file to a sharing site (like zippyshare.com), then send me a private message with a link. Then, if I can, I will try to merge the Tali Remastered in your DLC_CON_END file in order to unblock your situation I will send you back this file. Maybe the mod will work in you game after that. A customized version has been made for this player. If other people using the Russian version of the game can not make the DLC work, send me a private message. I would share this custimized file on my nexus page. I put the file in DLC, I installed your suggestion replacement files, but she's showing up with normal skin when she walks in. Hello, be sure to read the readme file when you install this mod. 2- You must copy the file called : "DLC_CON_TaliMaster" to your "DLC folder" located yourdisk/\Games\Mass Effect 3\BIOGame\DLC. Then load your game, the DLC should work. -If you have copied the "Tali_Remastered_DLC folder" directly into your DLC directory it will not work. (Because DLC_CON_TaliMaster is located inside this folder). But If you have already followed these steps and the mod does not work, give me the list of other mods you use. Is there a file i can delete so it doesn't retexture the Romance photo? Or can you release a version without the photo? Because AVPen's Romance mod does that. I changed my computer recently, my configuration is totally new, and I have not reinstalled the Mass Effect Moding tools on it. So, currently I can not provide any modifications on this mod. If you are an advanced user and you know what you do, you can try the manipulations listed below. However, I can not be held responsible if you fail or if your game encounters problems. 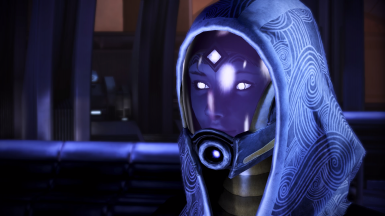 The Tali Remastered picture is located in the file named : BioD_Nor_100Cabin.pcc (the weight of my file is 8425 Ko). 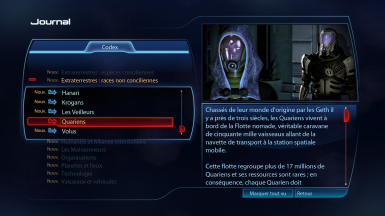 -Remove the file named BioD_Nor_100Cabin.pcc, then use the Mass Effect 3 mod manager tool (or the ME3 Explorer tool) and search the "update Toc" or "Auto Toc" function to refresh the DLC consoleTOC.bin controller. -Refreshing TOC is very important, If you do not refresh it your game will encounter crash, because each DLC are scanned when you launch the game to be sure that files are not corrupted. After updating TOC, It's done, you can play. Replace my BioD_Nor_100Cabin.pcc by your own BioD_Nor_100Cabin.pcc, or by coping the official BioD_Nor_100Cabin.pcc (if you want the original picture provided by Bioware). If the weight of your file (BioD_Nor_100Cabin.pcc) is lower than my BioD_Nor_100Cabin.pcc, maybe the DLC should work without using the updating TOCfunction (but not recommended). If your file is bigger than 8425 Ko, you will have to refresh TOC for sure. 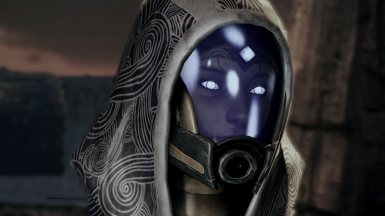 Finally, if you use the official photo of Tali, know that her face does not match to my 3D face model, this explains why this LDC includes a new picture, but you do as you wish, the most important thing is that you are satisfied with your gaming experience. 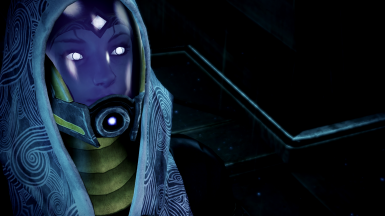 In the case this DLC does not contain result that you are looking for (headband & jewel), maybe you can try Tali full face mod from Getorex, it may be more appropriate, because editing my DLC is now complicated for me. 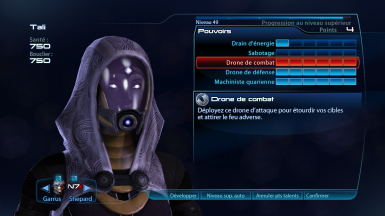 Furthermore,Tali full face mod does not provide headband/jewel and a cabin picture. Thanks so much! I will try to delete BioD_Nor_100Cabin from DLC_CON_TaliMaster and then autoTOC! That's really the only thing that both mods do, and since the mount priority of Tali Romance Mod is lower, maybe that would mess up things. But AVPen has said that it should be totally compatible besides the photograph! Seconding the request for a version without the diadem, albeit for different reasons. 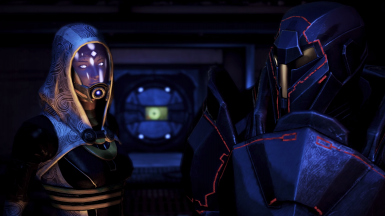 IMHO it looks gaudy, and it just doesn't make sense to me for quarians to wear something like that under a helmet. 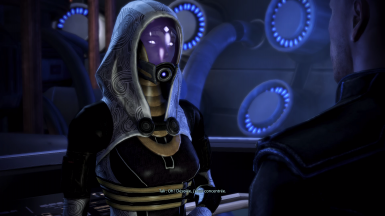 Also, no other Quarian wears anything like that. "however, EGM changes the organization of shepard's cabin. ?And install the "EGM Custom Extras Pack" to recover my picture." Im playing as femshep on me2 save files and I romanced Kaidan. So do I still need the patch ? You can apply this patch ---> the Tali Remastered Cabin picture will only be applied to its proper place, (that's mean on Tali's data). And you will not see her photo ingame if you are romancing another character. There will be no conflict with your romance after installing the patch. Soo cool! Will there be a version for ME2? This depends on the progress of the ME3explorer team, currently their tool (Meshplorer) does not support to export .pcc file format for ME2. When they will update this tool for ME2 file version, I should be able to try to export Tali Remastered on ME2 and see if it can work properly. No problem, you have succeeded your translation with google's tool, I have also a lot of Russian audiences on my YouTube channel. Thank you for coming back to this topic after your gaming session, I really appreciate this comment and your endorsement.